A while back a curious thought was planted in my head. It was a seed that came on the wind and stuck; I want to learn about food. I wanted to grow this idea, to explore food, food culture, agriculture, culture of agriculture, people, our relationship with what we eat, what it looks like, tastes likes, where it is grown – a connection with food, a connection with each other. This seed was first watered and given sunlight at Redwood Roots Farm in Arcata and at Mt. View Organics in Siskiyou County. As my hands worked in the soil, the seed in my head spread to my heart and the tender cotyledon leaves started to grow, true leaves emerged. 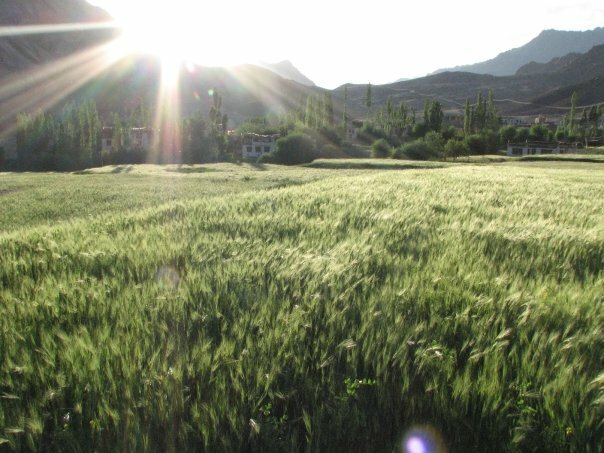 The seed and I traveled to the song filled barley fields of Ladakh and to the rich account of Navdanay’s seed bank in Derha Dun, India. The little seed inside grew. I grew and grew. We grew in knowledge of each other and in the knowledge that and we were becoming one. A fertile home at Green Fire Farm in Hoopa, 2010 was the season the seed’s roots went deeper and tapped through the heart into my soul. Scattering to Hope Seeds, Nova Scotia, in 2011 I was guided in cleaning the beginning and harvesting the end and through that process, another curious thought within me was pollinated: a desire to come home and grow, in connection with the community I love, through food and seeds. Homeward Bounty – the manifestation of a little, wind blown, seed and our journey together. This year I’m sowing a farm and a hope to grow the things I love and the community I hold dear. To save seeds and select for what will keep us sustained and together. Every year has it’s uncertainties, but it’s inevitable that something will grow!